"Greenhouse gases likely accounted for more than half of the widespread warmth across the continental United States last year, according to a new study by four scientists at NOAA’s Earth System Research Lab in Boulder, Colo. [snip] The NOAA team also found that the probability of U.S. temperatures breaking a record in 2006 had increased 15-fold compared to pre-industrial times because of greenhouse gas increases in Earth’s atmosphere." The report states that 2006's average temperature was "2.1 degrees F above the 20th Century average and marked the ninth consecutive year of above-normal U.S. temperatures." It also confirmed that every state in the continental United States had reported higher than normal temperatures and that 2006 was among the ten hottest years since 1895 (which was when they began to keep the records). The report went on to say that the: "authors also estimate that there is a 16 percent chance that 2007 will bring record-breaking warmth." This is not new information. Not to the farmers going out of business in Southern California (1.93 inches of rainfall in 2006), or those forests dying in the high Sierras, or the Greek citizens fleeing for their lives from arson and negligence as their cradle of civilization burns, or the drought-stricken Turks converging on mosques in Ankara to pray for rain as the city cuts off their water supply for days at a time -- at the same time as their new, former Islamic party, albeit western leaning, President Abdullah Gul is sworn in against the wishes of their secular military who raised a ruckus at first, but then paused when they saw all those Gul supporters in mosques praying for rain had voted in his party as the majority and decided to wait and see whether Gul’s administration would live up to its secular promise. What is news? Four scientists from the established U.S. government agency responsible for reporting on the weather have put it in writing: Global warming is real, it is caused primarily by greenhouse gases and it's very likely to cause record-breaking temperatures yet again this year. Here's a link to the NOAA report. Just after George Bush announced his plans to address climate change, both NOAA and NASA experts revealed that the Bush Administration is "drastically scaling back efforts to measure global warming from space." Bush Climate Meeting Draws Doubts about Action – August 08, 2007 – By Deborah Zabarenko (Reuters) -- A U.S. summit in September on climate change, one of at least four international meetings set for this year, is already raising doubts about any action being taken before President Bush leaves office.Link. So, what happened to the Climate Change Satellites? According to the American Association for the Advancement of Science, which calls it a crisis, Atmospheric scientist Timothy L. Killeen, the president of the American Geophysical Union, says it [the loss of the satellites] "could harm our ability to protect our citizens." and "Unfortunately, the recent loss of climate sensors ... places the overall climate program in serious jeopardy," NOAA and NASA scientists told the White House in the Dec. 11 report obtained by the AP. So, this means that George W. knew about this CONFIDENTIAL report that we weren't supposed to know about (which has now been leaked to the AP) before he announced his climate change initiative for September. But, it's not only the Bush Administration that needs to be taken to task for this debacle. According to the report, the White House requested $331 million for their scaled back version of the satellite system in their 2008 budget. A major study has just been completed by the National Research Council, entitled Earth Science and Applications from Space: A Community Assessment and Strategy for the Future: The Space Studies Board, in consultation with other units of the NRC, will lead a study to generate consensus recommendations from the Earth and environmental science and applications community regarding a systems approach to space-based and ancillary observations that encompasses the research programs of NASA and the related operational programs of NOAA. Committing to the 17 highest-priority new Earth-observation missions, out of more than 100 candidates evaluated for the 2010-2020 time period. The study concluded that its recommendations could be funded until 2020 by returning the Earth-science budget at NASA to its FY 1998-2000 level and stabilizing the budget of NOAA’s National Environmental Satellite Data, and Information Service at only slightly above the FY2007 level, adjusted for inflation. 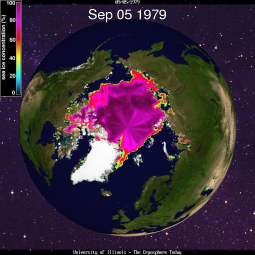 Jerry Mahlman, a former scientist at NOAA who is now at the National Center for Atmospheric Research, said he and other colleagues warned of problems as far back as 1995. He compared the preparations for the satellites to a "planned train wreck." The planned satellites Jerry Mahlman is referring to? The National Polar-orbiting Operational Environmental Satellite System, or NPOESS, which was first announced in 1994. This system was to combine the Defense Department's weather forecasting with NOAA's climate data gathering. There was also a provision for involving Europe and Japan's Meteorological Satellites. In 2005, however, the GAO found cost overruns to the tune of 9.7 billion (with a B) in an effort that was over a year behind schedule. The Pentagon weighed in last year, citing the program at 11.5 billion and even further behind schedule. The White House's answer? Science Advisor Marburger: "We’re obviously very concerned about this," he told the AP. "It got in trouble and we couldn’t fit all those instruments on it ..."
The Pentagon, the National Oceanic and Atmospheric Administration and NASA have announced they will have to rely on European satellites for most of the climate data until they figure this out. The EPA's Director of Experimental Toxicology, Linda Birnbaum, a co-author of the study, went on to say that "this could be a warning sign for how young children could get exposed to the chemical." The paper makes a convincing case that cats can be "a useful sentinel species for both [human] exposure to PBDEs and examination of endocrine disruption," notes Tom Webster, an associate professor at the Boston University School of Public Health's department of environmental health. Link. "I don't think we know about (human) health yet, but I don't like the sound of this," said Webster. "Levels in people are going up." Link. "Because the cat study is so preliminary," Birnbaum said, "people shouldn't overreact and sell their furniture or rid themselves of carpets." However, she said she makes sure to wash her grandchildren's blankets more frequently and checks on flame retardant use when buying furniture. Link. This is an unfortunate potential validation for the times we have been told of the necessity for the dreaded chores of dusting, cleaning and laundry. If you have cats, children or if you happen to breathe the air yourself, best practice may be to keep your house, furniture, carpets and fabrics as free of dust as possible until more tests can be done and to check the type of flame retardant used (or not used) when purchasing new goods. The BBC's Malcom Brabant referred to Greece's crisis as an "absolutely terrible summer with more than 3,000 [fires] so far that, until now, has been seen as a largely ecological disaster with some of the most beautiful landscapes being destroyed..."
With long-range computer models showing Dean turning north after striking Mexico, officials in Texas and Louisiana launched preparations for a possible midweek landfall. Louisiana Gov. Kathleen Blanco declared a state of emergency Friday and activated the state's emergency response center. Texas Gov. Rick Perry called Dean an imminent threat and took steps to deploy emergency responders to the coast. Monitoring of the storm's track by state evacuation authorities. Preparations for early evacuation of the elderly and those with special needs. NASA is making arrangements to recall the Space Shuttle early if the storm requires an evacuation of the Huston Control Center. The current Hurricane Center projection has Dean hitting Jamaica on Sunday with sustained winds of 155 mph. "Everyone must take the threat very seriously and put in place all necessary safety measures," Jamaican Prime Minister Portia Simpson Miller said. The Cayman Islands are the next in a path that is projected to head toward Mexico's Yucatan Peninsula before veering north, where it will encounter the warm waters of the Gulf of Mexico. At that point, the storm may make landfall somewhere near the Texas/Mexico border. Since the projections are so early and the storm is potentially wide (possible category five), the variables on the path are wide, as well. What is not a projection: The steps being taken by those in its path, most notably Texas, to prevent a repeat of the disastrous outcome of failed evacuations experienced during Katrina and Rita, which includes the decision by NASA to land the space shuttle Endeavour early if the storm turns toward the Huston Control Center. As Dean is the first hurricane projected to make landfall on the US coast since 2005, it will be preparedness test for wherever it does hit, as it is already wreaking havoc on the islands of St. Lucia, Dominica and Martinique. Since this is most likely not the last big storm to hit the region this season, the more prepared the respective governments are, the better. Even with that, there will be (and already has been) loss of life and property, as all the preparations in the world cannot forestall that outcome in the path of a category five hurricane. Here's a link to Hurricane Dean's projected route. Turkey has long been known as the crossroads of the world; an ancient land where Greek philosophy was born, where Cyrus the Great battled King Croesus for supremacy, where Alexander the Great won his first battle against the Persian Empire and where, according to Plutarch, Julius Caesar spent thirty-eight days as a prisoner of the Cilician Pirates, only to return and crucify them all upon his release. The Turkish capital, which is suffering from drought and serious water shortages. Record-low snow and rainfall this past winter, coupled with searing summer temperatures, have shrunk the reservoirs of Ankara, a city of some 4 million people, leaving just enough water to last another three months. This is not a simple drought. It is an absence of precipitation coupled with record temperatures and water-source-overuse (an act of Man) from agriculture that has resulted in extreme rationing, with water supplies cut off from the population for days at a time. "We stand before you, we beg you to answer our prayers," said Fikret Latifoglu, the Imam of the Hacibayram mosque, one of the city's oldest, in leading special prayers for rain before the start of traditional Friday prayers. "Don't leave innocent children and the old, animals who cannot speak for themselves, the trees, the ants and the birds without water. We helplessly beg for Your mercy." "We are all Hrant Dink. We are all Armenians," Turkish demonstrators furious at the murder chanted. There are the Kurds, who comprise a significant portion of the population, with a small, growing percentage of their youth joining the US/EU designated terrorist group, the PKK, encamped across the border in the mountains of Iraqi Kurdistan. Now the party of the aforementioned Turkish Foreign Minister, Abdullah Gul, whose nomination for president sparked protests that filled their streets with secularists fearfull of his Islamic connections (coupled with the threat from the secular military if he didn't withdrawal), has won the majority in the recent elections and Gul has just been elected to the secular post. The Turkish armed forces said Monday that efforts were being made daily to undermine the secular republic, comments that came a day before Parliament was expected to elect a candidate with Islamist roots as president. In a country where so many have turned to religion to pray for rain, the secular military, the Kurdish and Armenian minorities, and the extreme nationalists may see themselves at a growing disadvantage. While it does not mean the country will digress into violence -- Turks are a cautious people -- it does bear notice that such a strategic location, one that is still the crossroads of the world, is undergoing resource pressures through climate change that could impact both their geopolitical and secular status quo. Today the Northern Hemisphere sea ice area broke the record for the lowest ice area in recorded history. The new record came a full month before the historic summer minimum typically occurs. There is still a month or more of melt likely this year. It is therefore almost certain that the previous 2005 record will be annihilated by the final 2007 annual minima closer to the end of this summer. In previous record sea ice minima years, ice area anomalies were confined to certain sectors (N. Atlantic, Beaufort/Bering Sea, etc.). 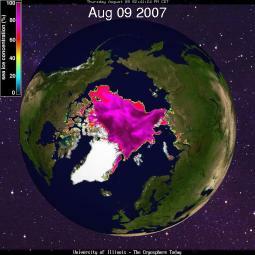 The character of 2007's sea ice melt is unique in that it is dramatic and covers the entire Arctic sector. Atlantic, Pacific and even the central Arctic sectors are showing large negative sea ice area anomalies. A few people have already remarked on some pretty surprising numbers in Arctic sea ice extent this year (the New York Times has also noticed). The minimum extent is usually in early to mid September, but this year, conditions by Aug 9 had already beaten all previous record minima. Given that there is at least a few more weeks of melting to go, it looks like the record set in 2005 will be unequivocally surpassed. There's no other way to describe this than the New York Times article title: "Analysts See 'Simply Incredible'Shrinking of Floating Ice in the Arctic." The scientists are redoing their models to account for the increase in shrinkage, but this picture and then this picture should make the problem clear. Here's the link to the NY Times article. Zhang Shuhong, who ran the Lee Der Industrial Co. Ltd, killed himself at a warehouse over the weekend, days after China said it had temporarily banned exports by the company, the Southern Metropolis Daily said. The suicide comes less than a week after Mattel's announcement identifying Lee Der Industrial, in Guangdong province, as the manufacturer of the toys, which were sold under the Fisher-Price brand in the United States between May and August. Link. One interesting difference in this story from the pet food recall debacle where Menu Foods waited until many more pets had died before they reported their suspicions: It seems that Mattel reported the lead paint in the imported toys more quickely and issued an apology to their customers. That's the good news. The bad? With less than a one percent inspection U.S. government inspection rate of imported goods, it begs the question what else may be getting through that has not been reported by companies as forthcoming as Mattel? Here's the link to the CBS/AP story. Size LT235/75R-15, models CR861 and CR857, with a DOT number beginning 7DT5FTS. Size LT235/85R-16, models CR860, CR861 and CR857, with a DOT number beginning 7DT2FTS. Size LT245/75R-16, models CR860, CR861 and CR857, with a DOT number beginning 7DT3FTS. Size LT265/75R-16, models CR860, CR861 and CR857, with a DOT number beginning 7DT4FTS. Size LT31X10.5 R-15, models CR857 and CR861, with a DOT number beginning 7DT6FTS. With 287 Billion (with a B) dollars of Chinese imports and a less than 1 percent inspection rate, is it any surprise that I'm surprised that these quarter-million defective tires have been found? Here's the link to the CNN story. Nearly 100 countries speaking at the first U.N. General Assembly meeting on climate change signaled strong support for negotiations on a new international deal to tackle global warming. There was so much interest among worried nations — many facing drought, floods and searing heat — that the two-day meeting was extended for an extra day so that more countries could describe their climate-related problems, how they are coping, and the help they need. The meeting is focused on signing an upgrade/replacement to the Kyoto accord that will take into account the new tipping point deadlines provided by the IPPC and the UN's own Climate Change Roadmap. The report goes on to say that the new UN Secretary General, Ban Ki-moon, has made climate change a top priority and that he is urging all countries to reach a comprehensive agreement by 2009 (too late? Maybe. But it's more than was done before). President Bush invited representatives of major industrialized and developing countries to a separate climate change summit on Sept. 27-28, hosted by Secretary of State Condoleezza Rice, to discuss “life after” the Kyoto Protocol expires. “In recent years, science has deepened our understanding of climate change and opened new possibilities for confronting it,” Bush said in his invitation letter Friday. Hmmm.... Life after the Kyoto Protocol expires... Did I miss where we signed that??? What will that life be like? Here's a link to a bit more on the hot politics behind global warming. A story on the UN's climate change roadmap. And here's the link to the MSNBC-AP article on the new UN Climate Change Meetings.